Manchester City aren’t merely the best performing team in England’s Premier League so far this season – they are, by a huge distance, the best team in any division in the country in terms of points per game. With 31 points from 11 league matches, Roberto Mancini’s side have an average of 2.82 points per game, which puts them way ahead of Manchester United (2.36 points per game), who are second in the Premier League and across England. 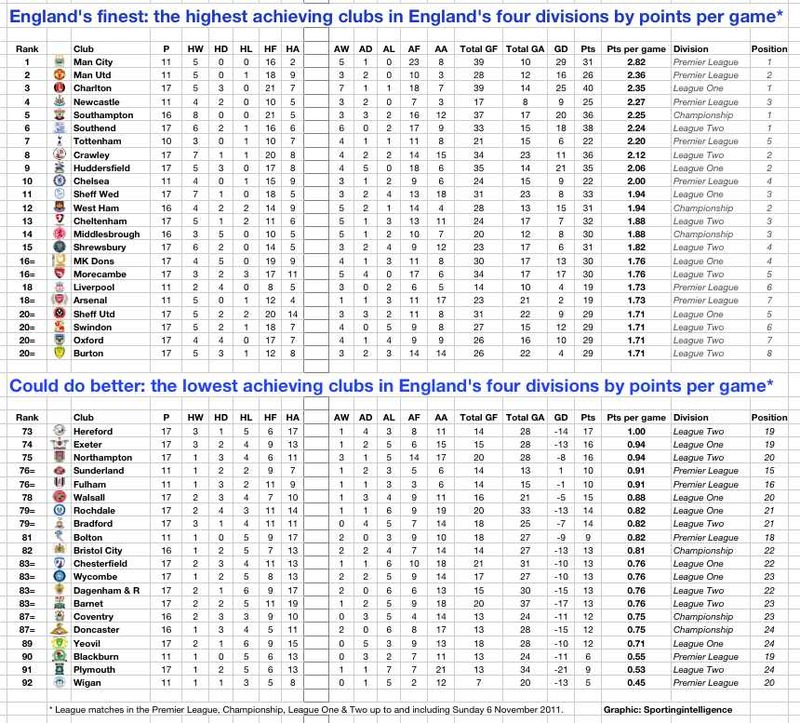 Sportingintelligence has compiled a composite table (below in this article) of the 92 clubs in England’s top four divisions to assess teams at different levels on a like-for-like basis. At a glance the table allows you to see which sides are thriving nationwide as the November international break arrives – and not just in your team’s division – and which teams are struggling. The top 20 teams (and ties) as well as the worst 20 teams are in the table below. City’s hugely impressive start to the season has seen them drop points in only one of their 11 league games – in the 2-2 draw at Fulham in September. Otherwise they have won the other 10. Charlton of League One are third in the composite table ahead of Newcastle, Southampton, Southend, Tottenham and Crawley, with Huddersfield and Chelsea making up the top 10, and Sheffield Wednesday, West Ham, Cheltenham and Middlesborough bubbling just beneath. The Premier League provides not just the best team in all of England so far but the worst too: Wigan. Their measly five points from 11 games gives them an average of 0.45 points per game, worse than anyone in the four divisions. Plymouth are next poorest, followed by Blackburn Rovers, Yeovil, Doncaster and Coventry.